Many discussions on the economy revolve around employment (industries, job polarization, etc) or the unemployment rate (with some discussion on short- vs long-term unemployed) but rarely do we put these two together. This is largely due to data and sample size concerns, which can make extracting the signal from the noise challenging at the state level. With that being said, recent work from our office resulted in detailed, occupational unemployment rates — used in discussing our OED friends’ job vacancy survey — but these exact figures do need to be taken with a grain of salt, even if the general patterns are true. The graph tries to help answer the question of who are the unemployed in Oregon. 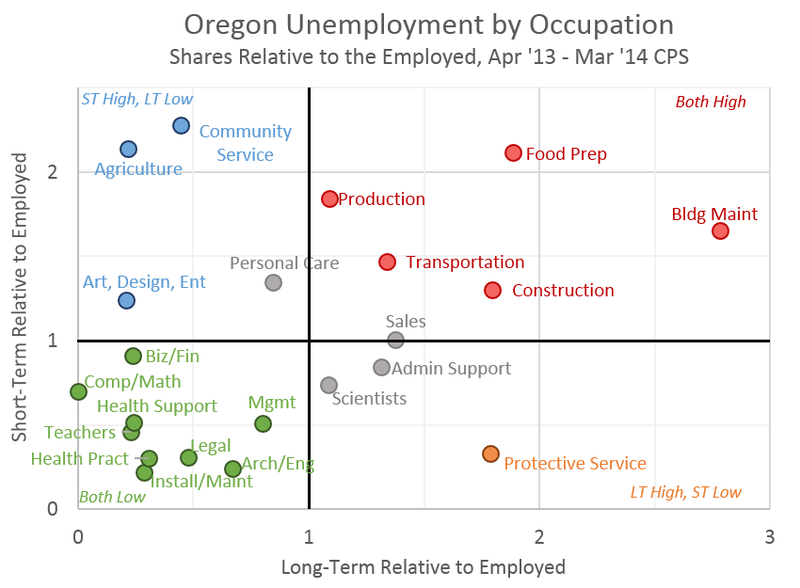 It compares the distribution of unemployed Oregonians across occupations, both short- and long-term, with the distribution of employment across occupations. These figures are akin to location quotients. Values greater than 1 indicate that workers from these occupations represent a disproportionately larger share of the unemployed than the employed. For example let’s take Food Preparation, one of the red dots. Food Prep workers account for 5.5 percent of all employed workers, however they account for nearly 12 percent of the short-term unemployed and just over 10 percent of the long-term unemployed (looking for work 6 months or longer). Using the location quotient methodology, this places the Food Prep occupation at nearly 2,2 on the graph indicating that Food Prep workers, effectively, comprise twice the amount of unemployed Oregonians relative to employed Oregonians. There are a number of interesting patterns that stand out. Among them: traditional, blue-collar occupations are high on both short- and long-term unemployment; many occupations with high rates of employee turnover also have high short-term unemployment, which is to be expected; occupations requiring college degrees are nearly all low among the long-term unemployed and most low among short-term as well. One additional point I will make is that Construction has seen considerable improvement in recent years. It is still red, however it used to much further out. This is because employment is increasing and unemployment decreasing among these workers (a win-win, not just do to the unemployed dropping out of the labor force). 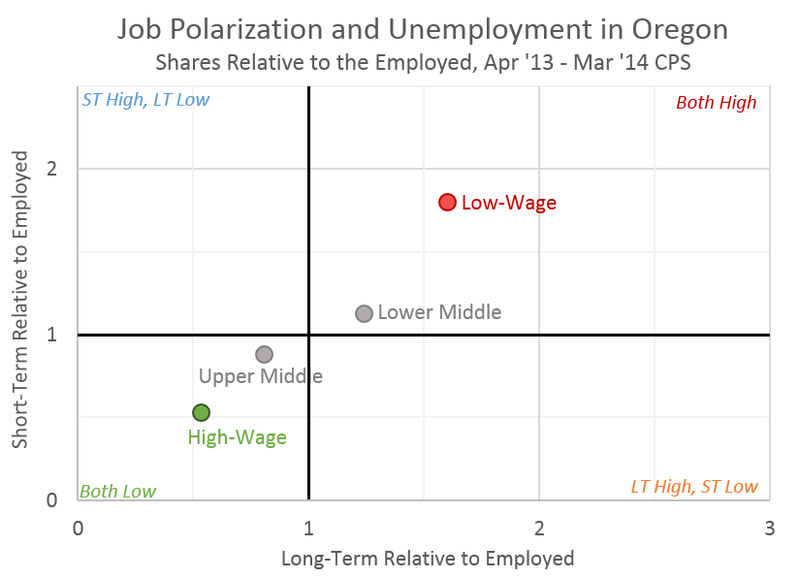 Simplifying the graph further and looking at it through the job polarization lens yields the Bonus Graph of the Week. Here the pattern is very clear. High-wage occupations have low levels of unemployment, middle-wage occupations are about what one would expect, relative to employment, while low-wage occupations have disproportionately high levels of unemployment.